New Rochelle, NY, September 18, 2018–A scoping review of studies on game interventions for cardiovascular disease (CVD) self-management found that the use of digital games improved exercise capacity and energy expenditure significantly. Average adherence rates for the game interventions ranged from 70% to 100% across all studies, and they were enjoyed by a majority of participants in studies that assessed perceptions of the interventions. However, the use of digital games did not affect quality of life, self-efficacy, anxiety, or depression, as reported in Games for Health Journal, a peer-reviewed publication from Mary Ann Liebert, Inc., publishers. 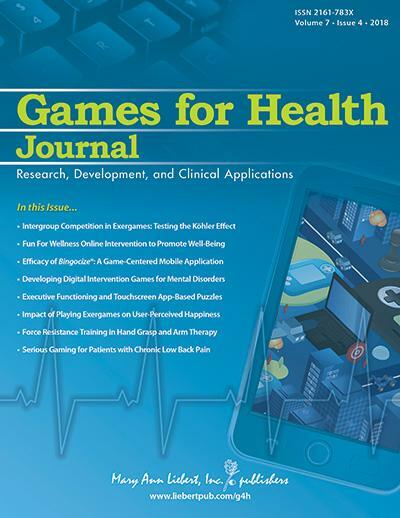 Click here to read the full-text article free on the Games for Health Journal website through October 18, 2018.